Each physical drive can be divided into several partitions Each partition can contain one file system Each file system contains: 1. boot block(s); 2. superblock; 3. inode list; 4. data blocks. 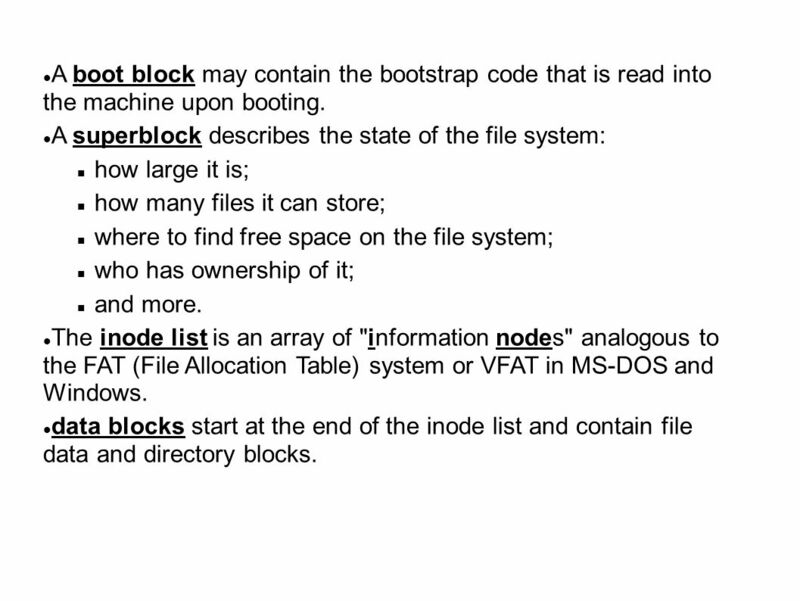 3 A boot block may contain the bootstrap code that is read into the machine upon booting. 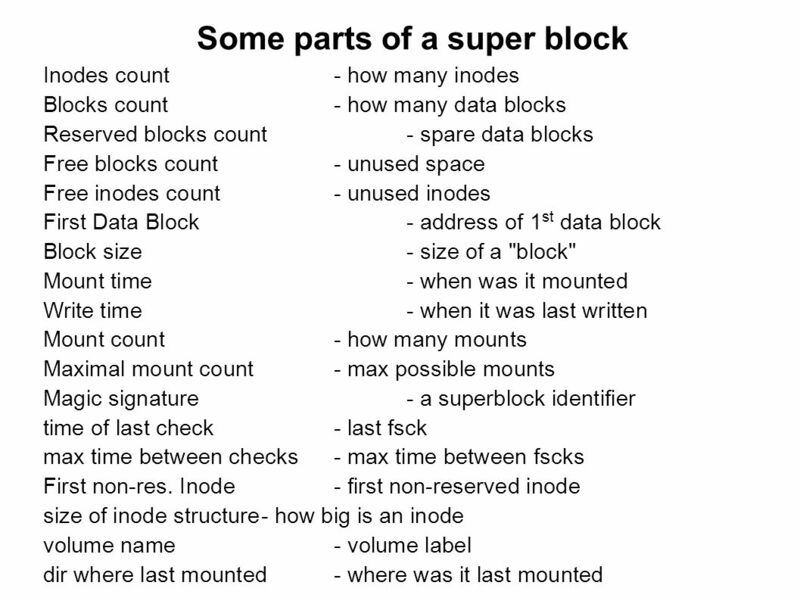 A superblock describes the state of the file system: how large it is; how many files it can store; where to find free space on the file system; who has ownership of it; and more. The inode list is an array of "information nodes" analogous to the FAT (File Allocation Table) system or VFAT in MS-DOS and Windows. 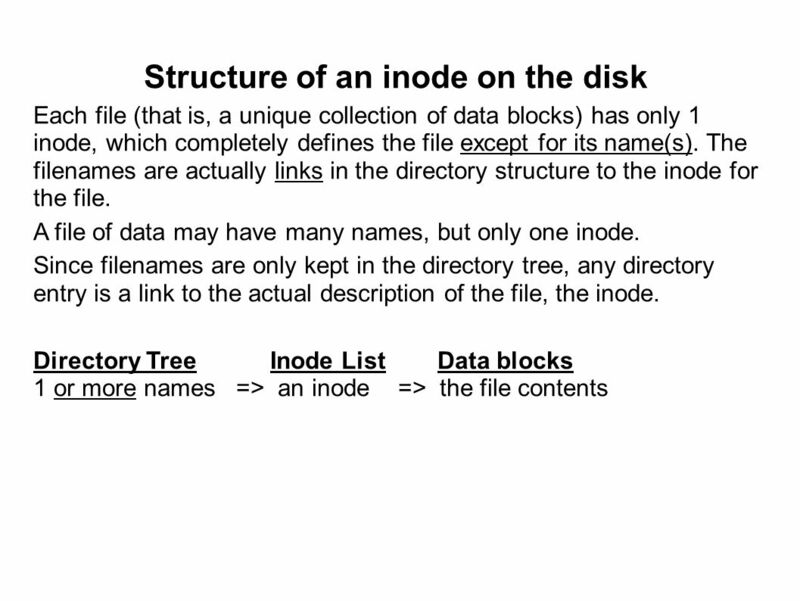 data blocks start at the end of the inode list and contain file data and directory blocks. 4 The directory "tree" usually spans many disks and/or partitions by means of mount points. 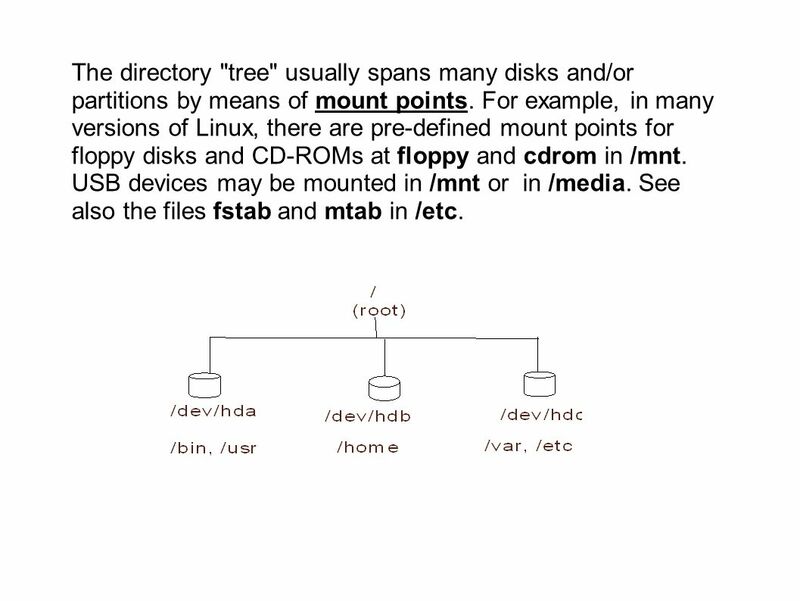 For example, in many versions of Linux, there are pre-defined mount points for floppy disks and CD-ROMs at floppy and cdrom in /mnt. USB devices may be mounted in /mnt or in /media. See also the files fstab and mtab in /etc. 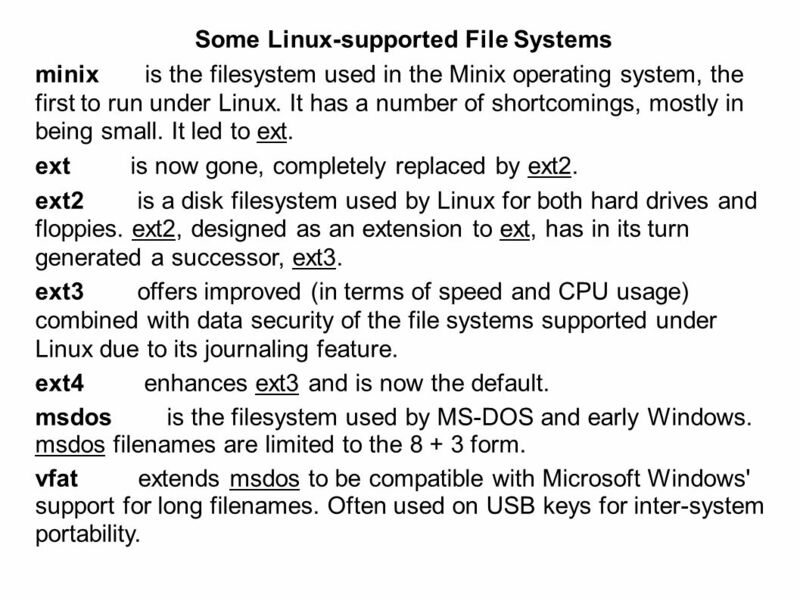 minix is the filesystem used in the Minix operating system, the first to run under Linux. It has a number of shortcomings, mostly in being small. It led to ext. ext is now gone, completely replaced by ext2. 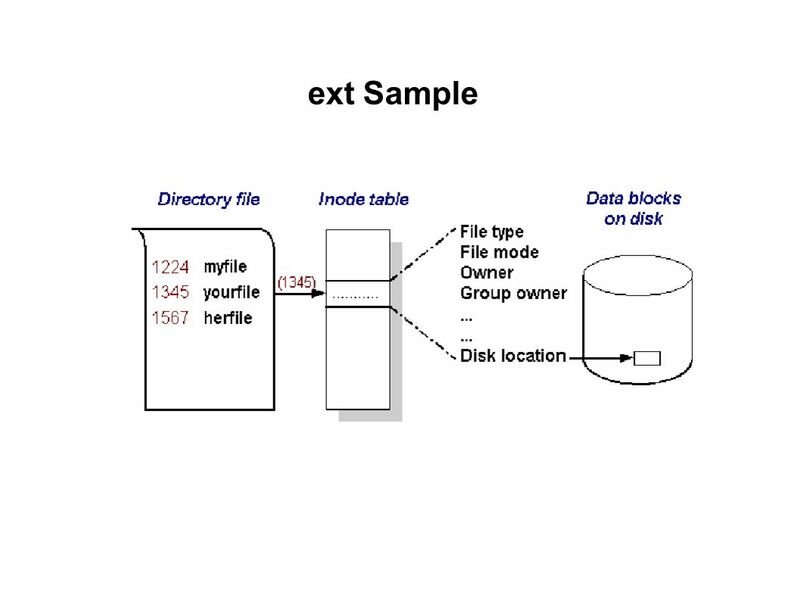 ext2 is a disk filesystem used by Linux for both hard drives and floppies. ext2, designed as an extension to ext, has in its turn generated a successor, ext3. ext3 offers improved (in terms of speed and CPU usage) combined with data security of the file systems supported under Linux due to its journaling feature. ext4 enhances ext3 and is now the default. msdos is the filesystem used by MS-DOS and early Windows. msdos filenames are limited to the form. vfat extends msdos to be compatible with Microsoft Windows' support for long filenames. Often used on USB keys for inter-system portability. 6 ntfs replaces Window's VFAT file systems with reliability, performance, and space-utilization enhancements plus features like ACLs, journaling, encryption, and so on. proc is a pseudo-filesystem which is used as an interface to kernel data. Its files do not use disk space. See proc(5). iso9660 is a CD-ROM filesystem type conforming to the ISO standard, including both High Sierra and Rock Ridge. nfs is a network filesystem used to access remote disks, mostly on TCP/IP networks. nfs4 is the current version of nfs. smb is a network filesystem used by Windows. 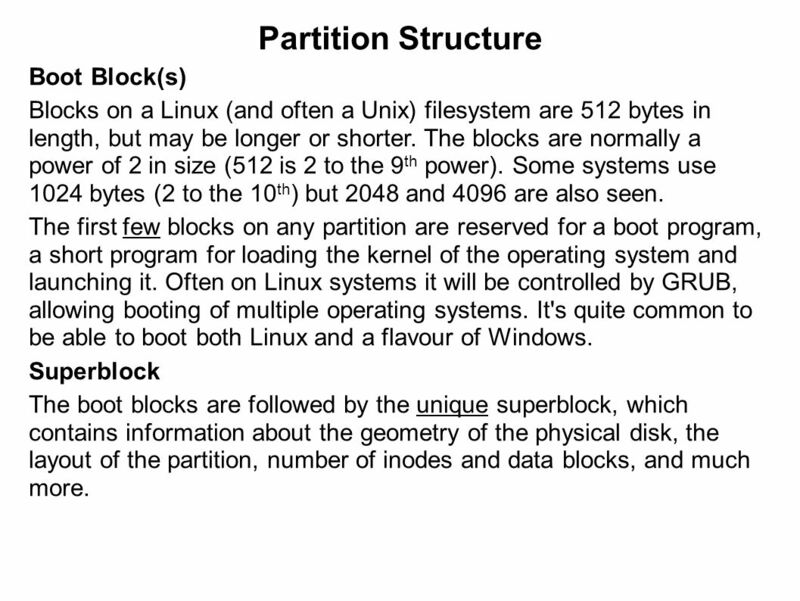 Blocks on a Linux (and often a Unix) filesystem are 512 bytes in length, but may be longer or shorter. The blocks are normally a power of 2 in size (512 is 2 to the 9th power). Some systems use bytes (2 to the 10th) but 2048 and 4096 are also seen. The first few blocks on any partition are reserved for a boot program, a short program for loading the kernel of the operating system and launching it. Often on Linux systems it will be controlled by GRUB, allowing booting of multiple operating systems. It's quite common to be able to boot both Linux and a flavour of Windows. Superblock The boot blocks are followed by the unique superblock, which contains information about the geometry of the physical disk, the layout of the partition, number of inodes and data blocks, and much more. 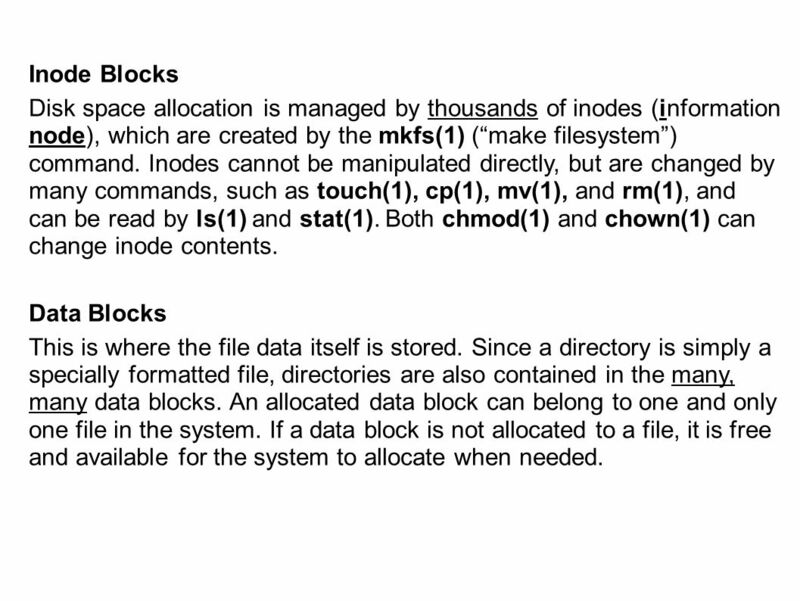 8 Inode Blocks Disk space allocation is managed by thousands of inodes (information node), which are created by the mkfs(1) (“make filesystem”) command. Inodes cannot be manipulated directly, but are changed by many commands, such as touch(1), cp(1), mv(1), and rm(1), and can be read by ls(1) and stat(1). Both chmod(1) and chown(1) can change inode contents. Data Blocks This is where the file data itself is stored. Since a directory is simply a specially formatted file, directories are also contained in the many, many data blocks. An allocated data block can belong to one and only one file in the system. If a data block is not allocated to a file, it is free and available for the system to allocate when needed. 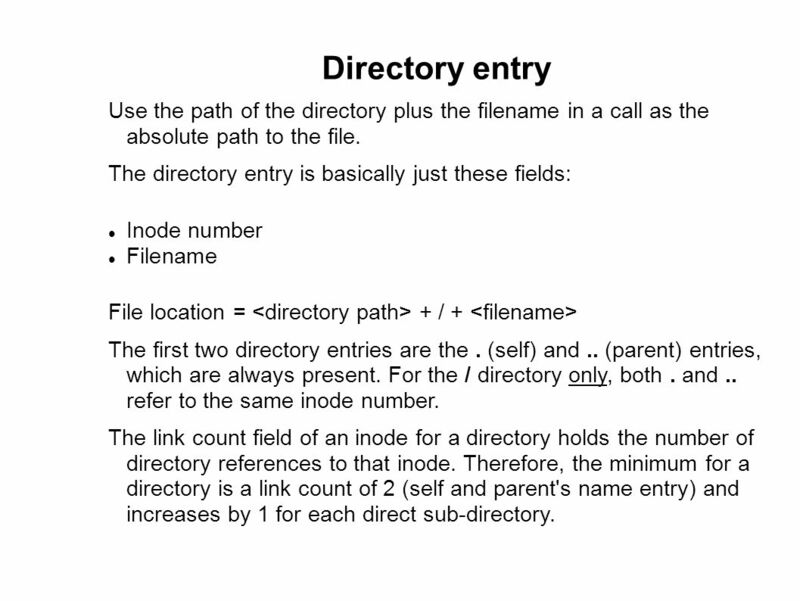 13 Directory entry Use the path of the directory plus the filename in a call as the absolute path to the file. 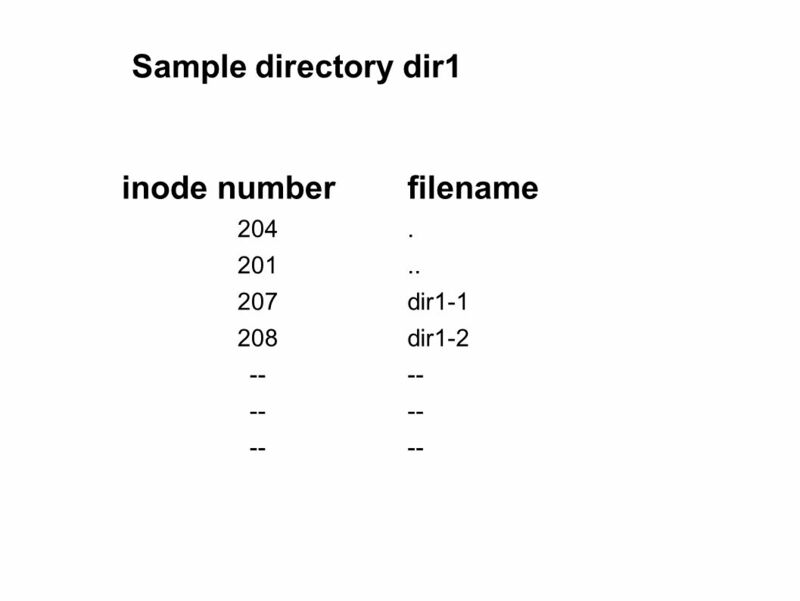 The directory entry is basically just these fields: Inode number Filename File location = <directory path> + / + <filename> The first two directory entries are the . (self) and .. (parent) entries, which are always present. For the / directory only, both . and .. refer to the same inode number. The link count field of an inode for a directory holds the number of directory references to that inode. Therefore, the minimum for a directory is a link count of 2 (self and parent's name entry) and increases by 1 for each direct sub-directory. 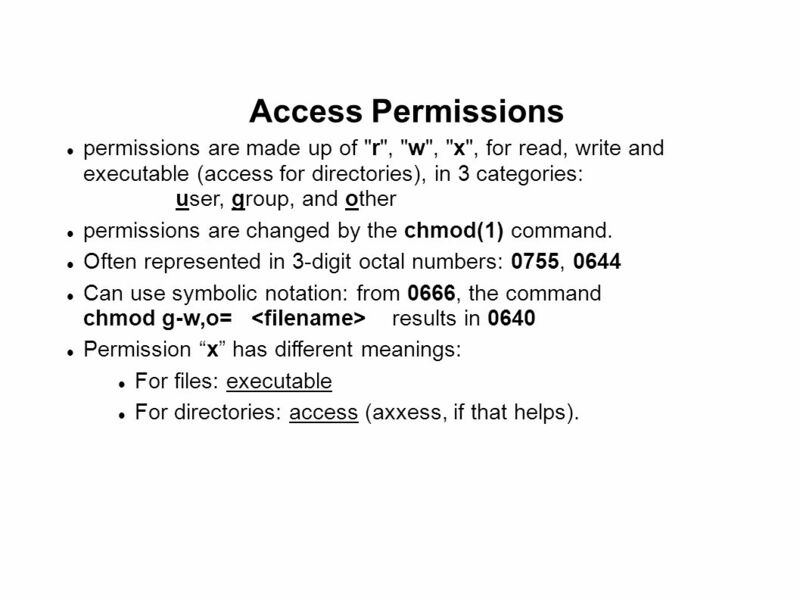 18 Access Permissions permissions are made up of "r", "w", "x", for read, write and executable (access for directories), in 3 categories: user, group, and other permissions are changed by the chmod(1) command. Often represented in 3-digit octal numbers: 0755, 0644 Can use symbolic notation: from 0666, the command chmod g-w,o= <filename> results in 0640 Permission “x” has different meanings: For files: executable For directories: access (axxess, if that helps). 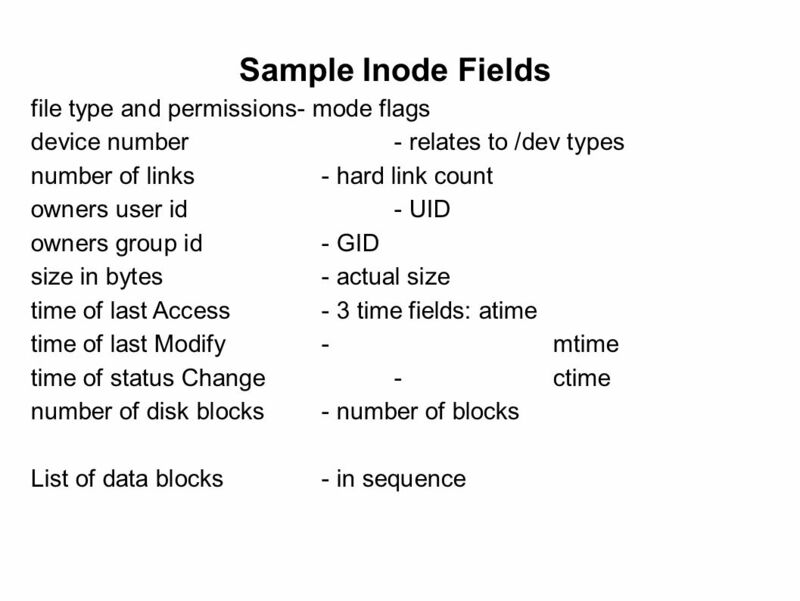 A collection of data blocks, as listed in the inode If the list in an inode is full, a second (third, 4th, etc.) 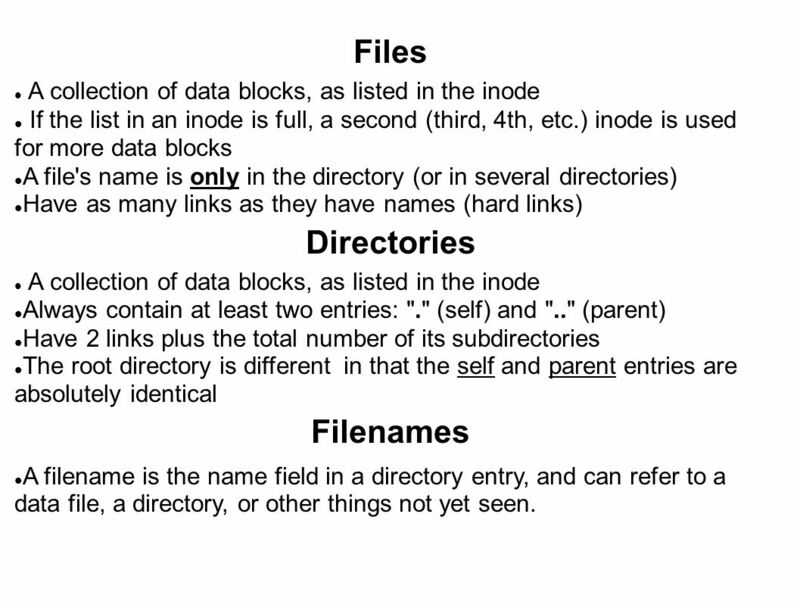 inode is used for more data blocks A file's name is only in the directory (or in several directories) Have as many links as they have names (hard links) Directories Always contain at least two entries: "." 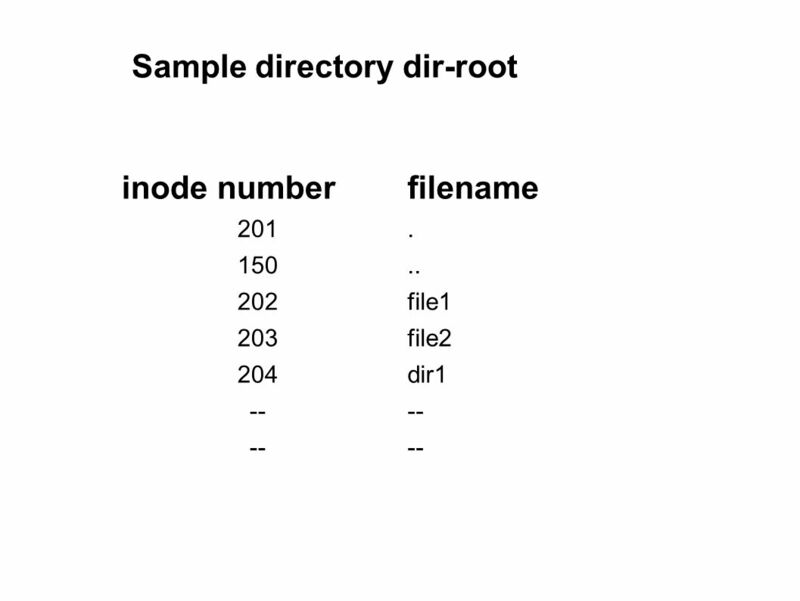 (self) and ".." (parent) Have 2 links plus the total number of its subdirectories The root directory is different in that the self and parent entries are absolutely identical Filenames A filename is the name field in a directory entry, and can refer to a data file, a directory, or other things not yet seen. System Prompt: ls -l -rw-r--r-- 2 allisor staff 0 D/T abc lrwxr-xr-x 1 allisor staff 3 D/T s-abc -> abc -rw-r--r-- 2 allisor staff 0 D/T h-abc System Prompt: rm abc -rw-r--r-- 1 allisor staff 0 D/T h-abc Removing one hard link has no effect on another hard link, but it can break a soft link so it no longer points to a file. Here, the original file still exists although its name (which was just another hard link) is gone. Its second name is still there and provides access to the inode and data content. 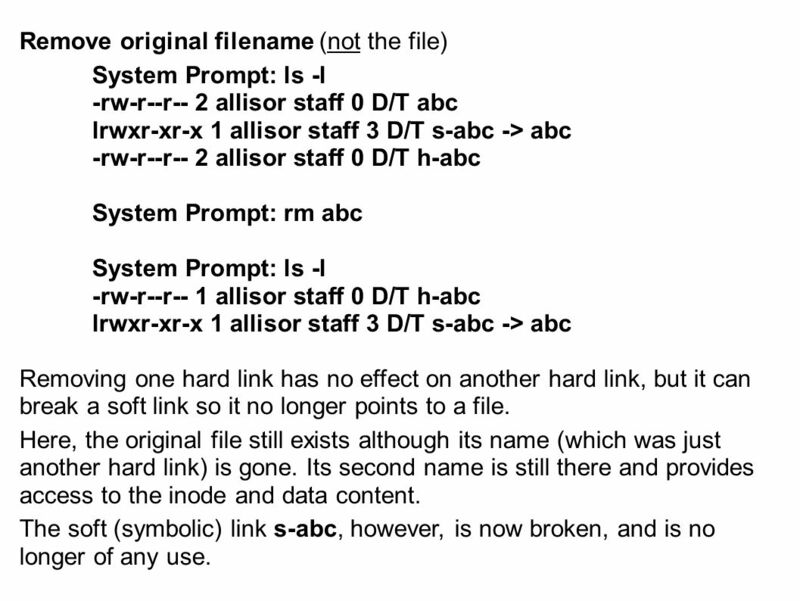 The soft (symbolic) link s-abc, however, is now broken, and is no longer of any use. 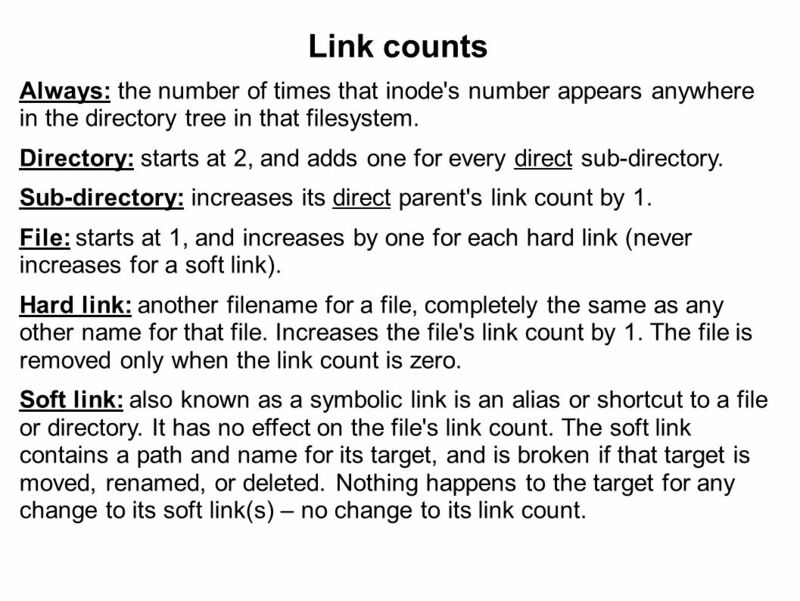 23 Link counts Always: the number of times that inode's number appears anywhere in the directory tree in that filesystem. Directory: starts at 2, and adds one for every direct sub-directory. Sub-directory: increases its direct parent's link count by 1. File: starts at 1, and increases by one for each hard link (never increases for a soft link). Hard link: another filename for a file, completely the same as any other name for that file. Increases the file's link count by 1. The file is removed only when the link count is zero. 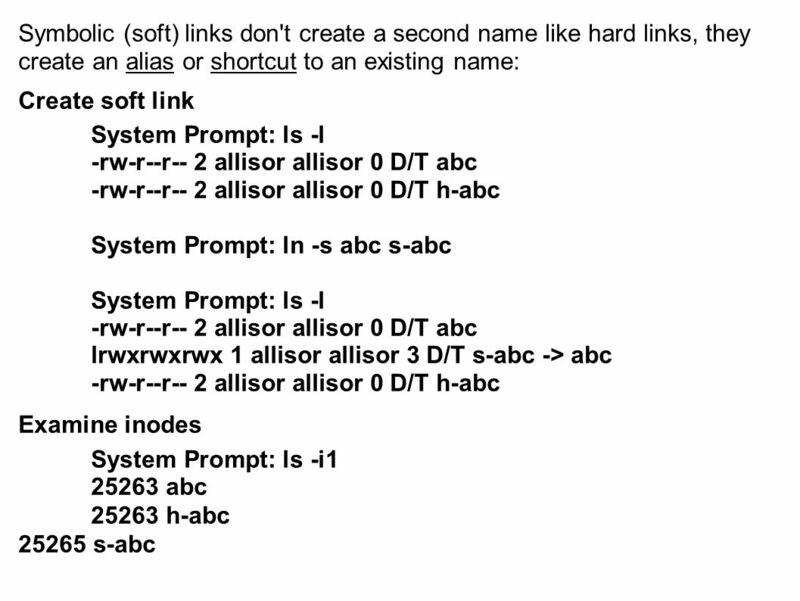 Soft link: also known as a symbolic link is an alias or shortcut to a file or directory. It has no effect on the file's link count. The soft link contains a path and name for its target, and is broken if that target is moved, renamed, or deleted. Nothing happens to the target for any change to its soft link(s) – no change to its link count. 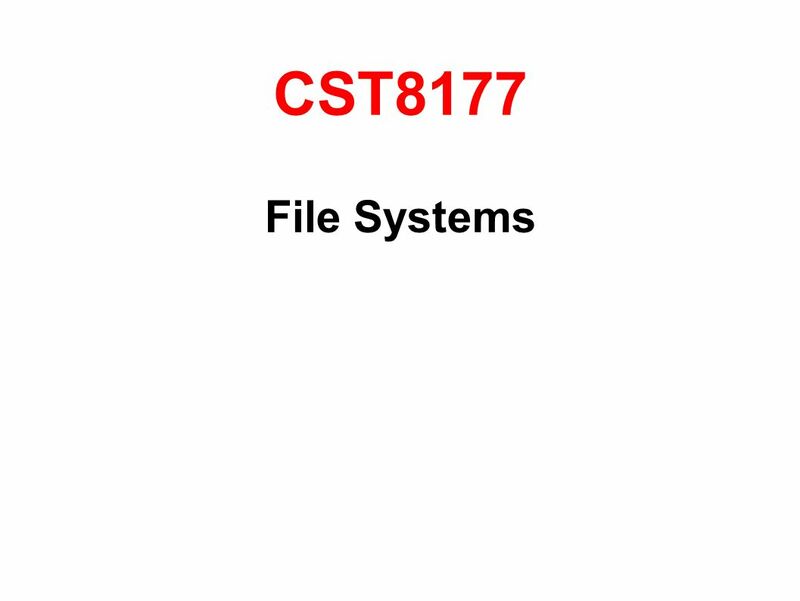 Download ppt "CST8177 File Systems." MORE FILE ATTRIBUTES. ls –l to display file attributes (properties) Listing of a specific directory Ownership and group ownership Different file permissions. Linux can be generally divided into four major components: 1. KERNEL – OS, ultimate boss The kernel is the core program that runs programs and manages. Ext2/Ext3 Linux File System Reporter: Po-Liang, Wu. Inodes. 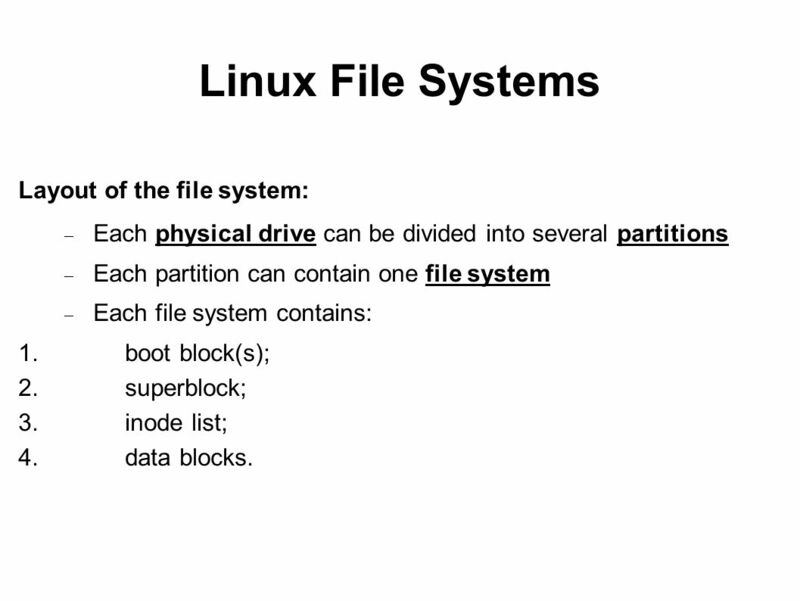 Filesystems Each partition has a filesystem –This filesystem will usually support a directory hierarchy Every file on a disk partition is allocated. 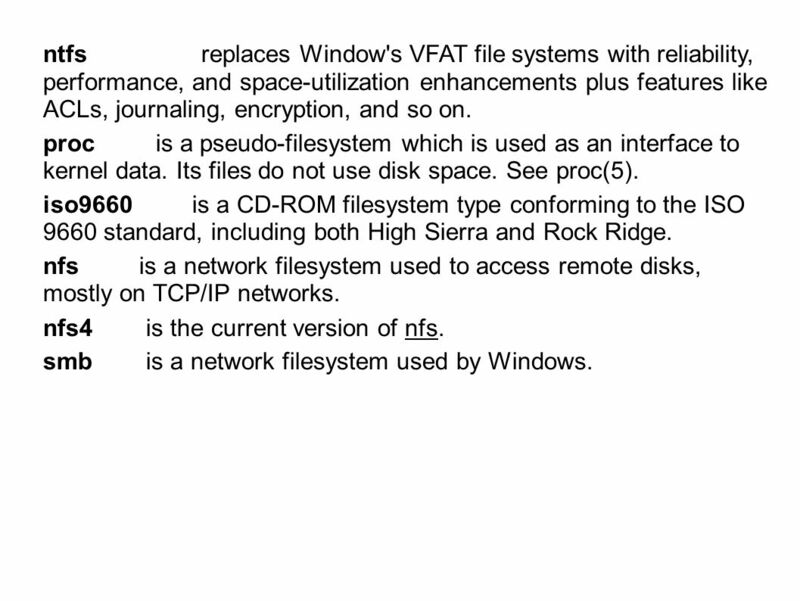 Lecture 10: The FAT, VFAT, and NTFS Filesystems 6/17/2003 CSCE 590 Summer 2003. Ext* Content Areas Inodes, Directories & Files. Review Recall …the file system metadata The superblock describes the file system The group descriptor. Laksh mi.  fdisk is an interactive utility to manipulate disk partitions.  Use fdisk –l to review the disks and partitions on the system.  Use fdisk. F ILE S YSTEMS comparison of FAT, NTFS, and Linux. 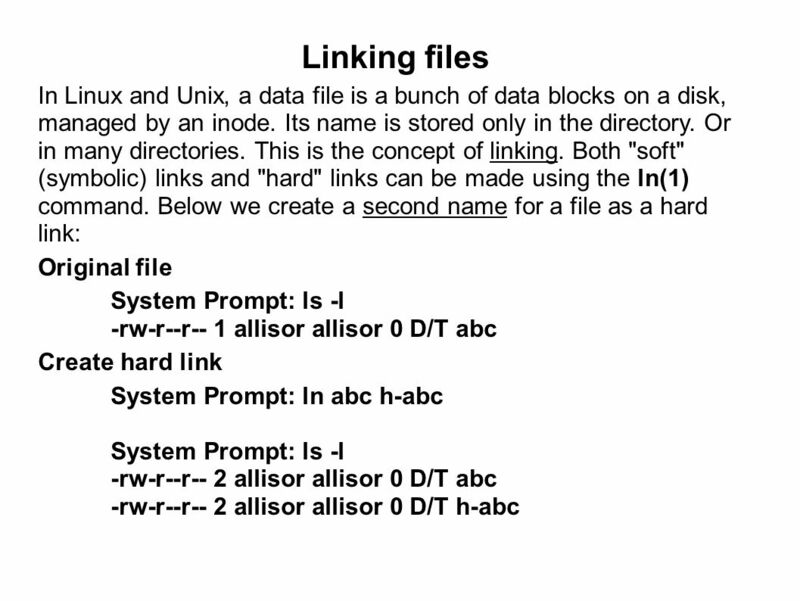 1 THE UNIX FILE SYSTEM By Chokechai Chuensukanant ID 121779 COSC 513 Operating System.